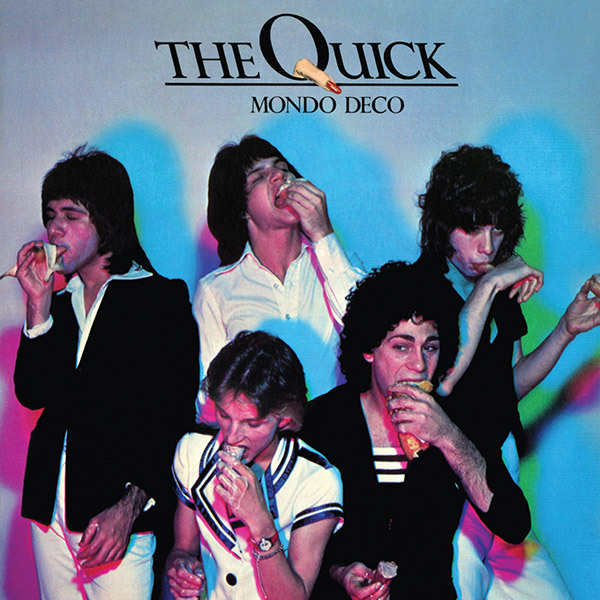 Reissue Review: The Quick, "Mondo Deco"
Welcome to the San Fernando Valley, circa 1976. Los Angeles’ own The Quick released one full-length album in their three year existence for Mercury Records – and now Real Gone Music has re-issued their debut, Mondo Deco, as an expanded edition. Released for the first time ever on CD, it features 11 bonus tracks; liner notes; archival photos; a recent band essay, track by track commentary and more! This post-glam, pre-punk, all-power-pop gem is at the epicenter of a truly mind blowing intersection of such disparate pop culture touchstones as NBC’s “Friends”, The Three O’Clock, The Cruzados, The Dickies, Kim Fowley, Frontier Records, The Runaways, Luke Skywalker, The Starwood, “Repo Man”, The Eagles’ “Hotel California” and Beck. To tie these threads together, simply get a copy of this album and read the notes – everything fits! My own vinyl copy, which I sought out several years ago, is fairly well-beaten up, so it’s a joy to revisit this on CD and hear it clean. Not to digress, let’s get to the songs – the original tracks that comprised this mid-’70’s masterpiece. From the opening notes of “It Won’t Be Long” (yes, the Lennon-McCartney classic), this band had a certain youthful magic about them; the vocals of lead singer Danny Wilde fit this arrangement and the sugary-pop style (not dissimilar to the glam sounds of the preceding years) make this not sound like a Beatles cover. “No No Girl” has a slash-it-up guitar sound that clearly shows where The Dickies developed their style from, not too long after; the arrangements are not what one would typically expect from a teenage band – some classical qualities, if you listen between the lines; “Hillary” should have been a hit single as it sounds like something that would have been on the air at the time; again, pop but sophisticated (it must be noted all originals were written by guitarist Steven Huftsteter) and the overall arrangement, feel, energy and vibe of “Hi-Lo” makes this one of the album’s absolute highlights. “Last In Line” is definitely one that had to have been influenced by Sparks – and does have touches of what would become more “new wave” in it; although recorded in ’76, it could have easily been recorded in ’81. “My Purgatory Years” is the magnum opus; a teen angst rock anthem that stands out for its sheer power and dramatic arrangements – and for me, the other standout. It’s easy to wax poetic about classic albums and hearing them after a lengthy period. But like so many albums I’ve loved over the decades, this is one of those that never get old. For even though it was made by young people for other young people in a different time, it’s one of those records that catapult you back to that moment. And when you remember how much you enjoyed hearing those songs both then and now, it’s double the thrill. As so many, The Quick deserved stardom. That it didn’t happen is typical, but I guess becoming legendary isn’t the worst thing in the world. This album certainly is. Now go do your homework and connect the dots from the first paragraph above – but first, buy a copy of Mondo Deco. *It must be noted that while the track “Hillary” is from Mondo Deco, we’ve included “Pretty Please Me” as well, since it’s such a great, classic track. Enjoy!